Shipping Calculater may be off, I will correct if this is the case and refund overpay!!! 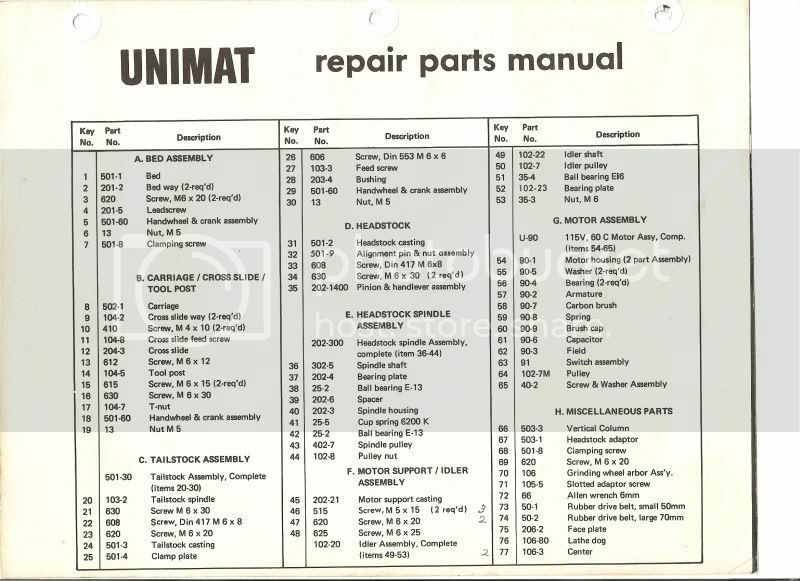 We have thousands of Unimat parts and many Accessories always in stock. If you don't see what you need or if it says "Out Of Stock", please call me or email me as I usualy have everything but just did not update this site. I do not list most Accessories I stock here at Toms Tool Store, just repair parts, please contact me anytime. We also stock hundreds of complete Lathe's - both DB 200's and SL 1000's (please Contact Us for pricing on whole lathe set-ups). We invite you to browse through our store and shop with confidence. We invite you to create an account with us if you like, or shop as a guest. Either way, your shopping cart will be active until you leave the store. We normally stock many Accessories: Lathe Threading Attachments, Slow Speed Attachments, Indexing Attachments, Automatic Feeds, Centers, Chucks, Milling Tables, Clamps, Saw Tables, Jig Saw Tables, Grinding Accessories, WW Spindles, and much, much more. We have anything and everything for your Unimat Lathe. This store is a little different from eBay. I will be showing generic pictures of all the Unimat Parts and Accessories we sell - all Parts & Accessories will be in very-good-to-perfect condition. If you order a Part or Accessory from me, it will be inspected before packing. If I notice that it is in less than very good condition, I will contact you and let you know what the actual condition is, you can then decide if you still want it. Many of you know me from eBay; you can expect the same fast, friendly, and honest service here. If you have any questions about items for sale, need to ask a technical question, or just need some advice, please contact me. This can be done in many ways... Call me at (413) 267-9257 anytime, email me at tomstoolstore@comcast.net or just click on the contact button found at the top of the page. All parts and accessories for a Unimat DB200 to a Unimat SL1000 are interchangeable - except for the Cast Iron DB's - which have a different clamping bolt making the headstocks and milling post and adapter's non interchangeable. If you need a milling post and adapter, please be sure what machine you have. An easy way to tell what machine you have is to turn your machine upside down; the underside will be cast with just one large X as ribbing if it is Cast Iron. If you have a Zamak or Aluminum machine you will see that it has many X's in the underside of the casting. To tell if your Unimat Lathe is Zamak or Aluminum, look again at the underside. Where the Lathe headstock post comes through, you will see six ribs supporting the post hole. On a Zamak casting, you will have just one round boss in the middle of the front rib - meaning that the six ribs are not alike: one, the front one, is different. On an Aluminum casting, five of the six ribs have these round bosses and the one rib towards the tailstock does not. Mystery solved!!! Call me if you have a question. Five machine tools in one, the Unimat is not only a small precision metal lathe, it converts in a minute to a universal drill press, vertical milling machine, small parts surface grinder, or grinding polishing head. It performs ALL common machining operations, and it's capable of the finest precision work. The tool equips an amateur or professional craftsman to precision - machine his own small parts from any material, metal, plastic, or wood. Thousands of hobbyists, commercial and hobby model makers, inventors, watchmakers, prototype labs, gunsmiths, camera repairmen, locksmiths and jewelers the world over use Unimat’s for a wide variety of miniature machining jobs. The basic Unimat's versatility and the many accessories available make the machine's uses almost unlimited. Surely the most fascinating little machine a craftsman could imagine, the Unimat is much more than simply an appealing little precision metal lathe. It is really a complete miniature machine tool system, a system of components that can be set up in various ways to perform on small scale any of the standard rotary metal machining operations, turning, drilling, milling or grinding. More than that, the many accessories available for the tool extend its capabilities even further, and even include units to convert the basic machine to any of several woodworking power tools. All this makes the Unimat not merely a combination tool but a universal tool, a complete machine shop in itself. No other small shop machine compares with it even after all these years. Other names you may reconize for this company may be; Emco, Maier or Edelstaal. 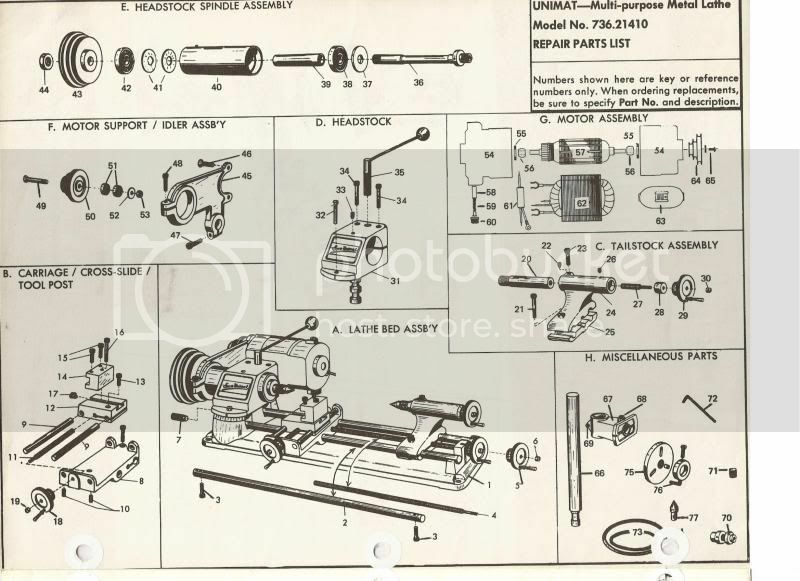 Click pictures for exploded view or UNIMAT parts list.